Nowadays you can find so many different baby bouncers, baby swings, baby rockers. Things used to be so much simpler when we were kids, right? Times change and I’m actually pretty jealous I can’t have one of the modern baby swings for myself. A good baby swing is priceless. Moms need to take a break sometimes or use two hands, really. As with all other baby gear, you want to pick just the best ones. This is why I decided to prepare a list of the best baby swings for 2019. Of course, there have been many baby swing reviews written before, but I’ve put much effort to narrow down the list of possibilites so you wouldn’t get a headache just from having to go through hundreds. As usual my approach stayed the same: safety first. You want to be sure nothing bad happens instead of providing you with a moment to catch a breath. One small swing for a baby, one giant leap for childhood. What is the best baby swing of 2019? 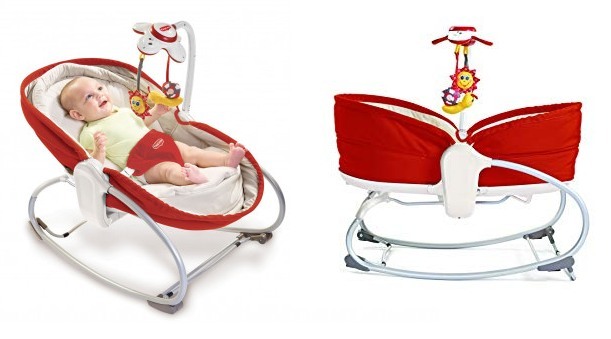 Below I present you the best baby swings and rockers, which I chose from all offers available online. In my opinion, every product on this list deserves attention. The DuetSoothe may run either on batteries or an electric socket at any particular time, it all depends on whatever suits you most. Which means that it doesn’t need to be stuck at one place inside your house, especially thanks to the handle located conveniently on the top of this device which allows you to carry it around however you please. The swing mode includes 3 different positions of the seat, allowing your baby to sway from side to side or back and forth. It can also be used as a rocker, with different settings for vibrations and a nice cushion seat to make your baby comfortable. 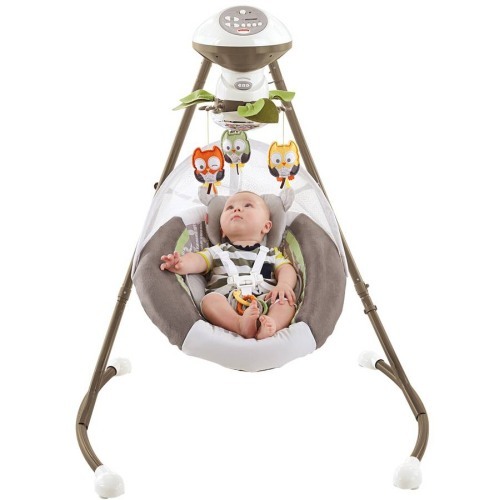 It also comes with a mobile attached, with 3 plushies to keep your baby entertained, as well as 6 different speeds of swinging, 10 different songs and 5 different sounds of nature that are sure to keep your kid happy and lulled in their comfy little seat. It’s truly filled with features that will make your baby think it’s the best baby swing in the world. Although technically it’s a swing, let me start this by actually talking about the rocker first, which will give more context to the swing part. The Sway swing’s seat actually is a detachable rocker, and you can use it with the swing base or separately. The comfy seat can accommodate kids up to 18 lbs and 27” in size. And I really mean it when I call it comfy – its so-called soft goods are made of plush (I’m talking about the seat’s cuddly cover here) plus an adorable little plush pillow for infants to provide comfortable napping. The seat cover can we washed in a washing machine and then air-dried. With the fabric’s light colors, it is pretty much obligatory if you don’t want it to be covered with stains. 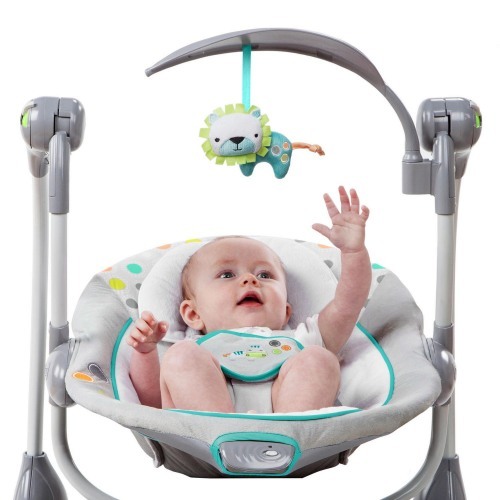 As for this product’s brilliant portability, you can release the rocker from the swing when you squeeze on its levers and get it up and then out, the same way as with car seats and bases. You can walk all around your house with this rocker, which I’m sure your baby will love. Especially that it comes with special handles for easy carrying. The product’s seat was just made with calming a cranky baby in mind. 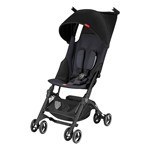 It comes with a gentle rocking feature that either you or the baby can put into motion. There are also 2 speed settings for vibrations. Now getting your baby to sleep is easier than ever. And even if your baby can’t go to sleep, there is also a toy bar for them to play with. You can easily attach this soft, flexible bar to the seat on either side of the top. You can either position it higher or low enough for your baby to hold it and play with it. There are also 2 stars made of plush that your baby can grab, as well as plastic links to attach more toys when your baby gets older. On top of that, the seat comes with a five-point safety harness, which helps keep your baby secure in place. Thanks to the three settings on its recline, however, they have no reason to want to leave, being able to sit up and enjoy the view. 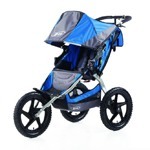 The key feature in the Duet Sway is its swing, which was intended for kids all the way up to 25 lbs and 30”. Which means that you will be able to be using it for quite a long time. It’s a good thing, as swinging feels like being carried to a baby, which is very calming to them. What truly makes this swing unique, possible the best baby swing out there actually, is the way this thing works. Its stationary, standing motor holds the swing seat/detachable rocker. The motor is contained in a compact housing and is pretty silent. Right-facing, when swinging front to back while facing right. 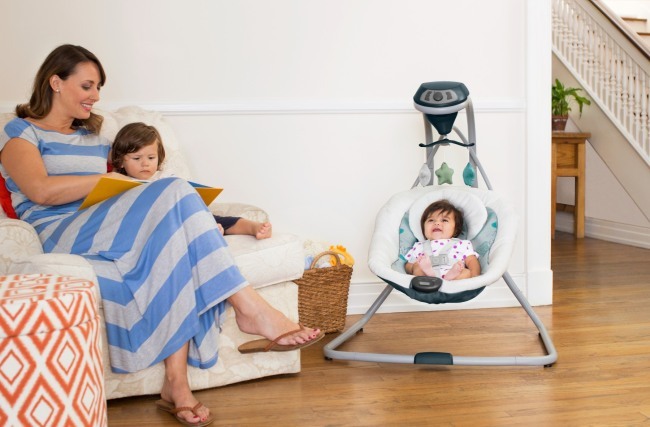 This brilliant 2-in-1 design allows you to save space the way the best baby swing should. Additionally, it allows you to place the swing against a wall without worrying that it will knock into something. Another awesome feature in this is its adjustable swinging motion speed. It gives newborns very gentle swinging while older babies get a little stronger swinging. When it comes to my own daughter, she would not cry as long as she kept moving noticeably. Which allows you to use the seat even longer with your baby. I have recently checked prices on Amazon and this baby swing was -20% OFF. You can check if the discount still applies by clicking here. Who does not love portable swings? This is one of them. The detachable rocker allows you plenty of portability when walking around the house. 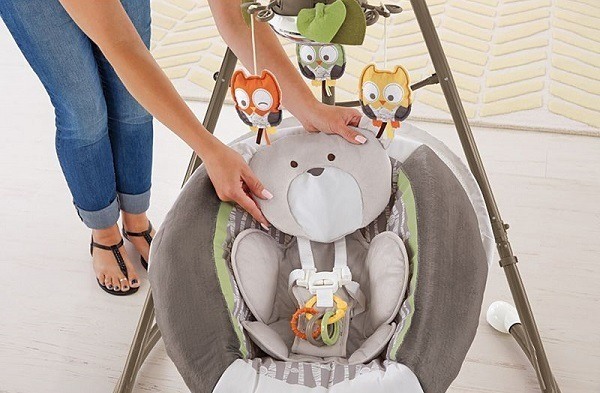 No need to worry that you’ll end up stuck in the same room when your baby is asleep, just detach the rocker and you can carry your little gingersnap wherever you want. What is more, even the swing is quite portable in itself. Its weight is a little above 17 lbs. Not too shabby if you take its solid metal frame into account. And when you fold down the seat all the way and remove the legs from the swing’s frame you can easily pack it up for a trip. This swing runs on AC power, and I simply love it. No batteries to worry about. I just hate it when batteries run out of juice in the middle of a nap and the baby wakes up all cranky as the result. Just make sure there’s a socket nearby and you’re set. The bouncer runs on batteries (on a single D battery to be exact). You don’t have to buy new batteries often as the vibrations don’t consume much power. And thanks to not being tied down to a socket, the seat is also as portable as it can be. 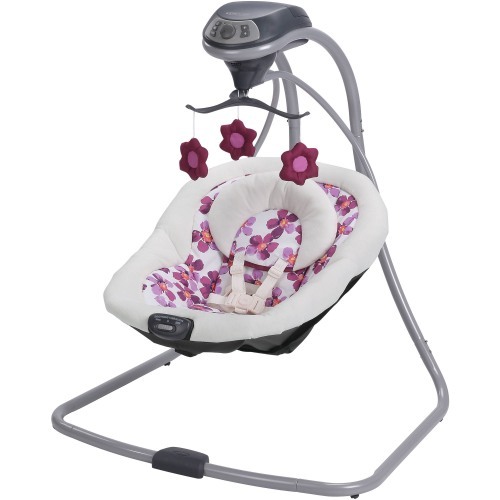 This swing works just as you’d expect from undoubtedly the best baby swing on the market. It can swing side to side or front to back while not taking up your whole room. Sometimes picking a different type of movement is crucial in getting the baby to sleep. You can even try rocking them gently in the rocker if nothing else works. Different movement combos can suit every baby out there! The last great thing about this swing is its price! It is actually pretty cheap for something that is essentially a rocker and a swing in one package! The first thing that struck me when unboxing this product was how many different parts it actually had! I actually needed my husband’s help, as he is more into building things than I am. He still had problems with certain steps, but luckily the assembly instruction had plenty of convenient illustrations to make it easier. The whole process took us more or less twenty minutes. Once we were done, it just spent the next week in our living room. Whenever we needed some more space we just pushed the Rocker Napper from one end of the room to the other, thanks to its light weight. It didn’t even require both of my hands, which means I can actually do it even when holding the baby in the other arm. Sadly, it cannot be collapsed, which means it’s not very likely to leave our house often. If there’s one thing the Rocker Napper would be the best baby swing thing at, it’s the appearance. Our model’s outside is bright-red and its internal padding has a neutral striped pattern. No cutesy cartoony animals or anything like that! Which I think is probably the reason why it didn’t bother us while occupying space in our living room. The sun & snail mobile as well as the music feature will keep the baby entertained for hours. Another neat little thing is the vibrating feature which is sure to soothe your kid. When it comes to its role as a rocker, it has to be propelled into a rocking motion by your own push, but the baby will probably be able to take care of it with their own movements as well. 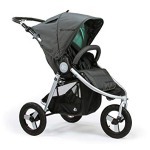 The napper comes with 3 different modes, which allows it to grow together with the baby. If you have a newborn, just set it down flat and put up the side walls to keep your baby safe and cozy in there. Then after few months you can collapse the side walls so that the baby has a little more freedom. And then finally there’s the reclined seat (by which point you can take the mobile out) for a baby with reflux, or to be used during meals. The Rocker Napper has come in handy in many different situations ever since our baby was born. 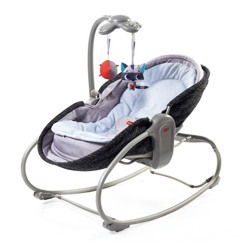 The music player and the vibrating feature in the Rocker Napper are great ways to keep a cranky baby distracted. The mobile even comes with flashing lights, which your baby is certainly going to love. The one thing I didn’t like about the Rocker Napper, however, is that it could have been a little easier to rock, especially on carpet surfaces. In terms of appearance, though, it more than makes up for it. 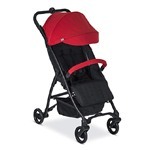 Interested in purchasing Tiny Love 3-in-1 Rocker Napper? Check how much it costs on Amazon and see if there are any discounts available. Another thing worth mentioning about the Rocker Napper is how low it actually is, only hovering about one foot above the floor level. Although it doesn’t pose a problem during the daytime, I’d advise against putting it next to your bed at night, unless it happens to be a pretty low one. In the end, the best thing about the Rocker Napper is its design, thanks to being lightweight and not having any flashy eye-violating patterns like some other products of this type. Its size also makes it perfect for smaller interiors. It’s nice to have a comfy place to put your baby in where they can have some entertainment while you need free hands for a moment. Easily adjustable, with three different positions that make switching from napping to playing a breeze. The mobile with its toys and flashing lights will keep any baby entertained. I love its practical, sensible design that’s easy on the eyes. It comes with retractable feet that can be used to switch between a rocker and stationary. It has a perfect size which makes it easy to move around the house. You can easily move the mobile out of the way when putting the baby inside. 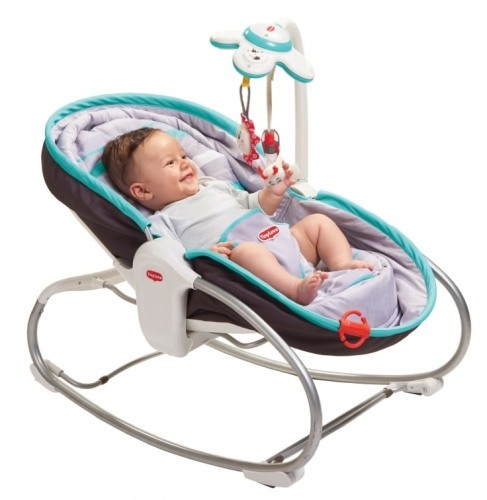 If you asked most parents what’s the best baby swing, many of them would probably point to the Fisher-Price My Little Snugabunny Cradle ‘n Swing, seeing how popular it is. As you can tell from the name, it is a cradle and swing in one package, and it can accommodate babies from birth all the way up to 25 lbs. Curious about the reason for its popularity, we decided to put it to a thorough test and see if it really deserves its good reputation. It comes with 6 speeds, 2 swinging motions and 3 cradle positions, which makes it a pretty versatile device. Its versatility might actually be the reason why so many see it as the best baby swing out there, with as many as 6 different swing speeds ranging from a very gentle rock to lull your little one to sleep all the way to more energetic yet still gentle rocking motion that will surely keep the baby entertained. On top of that, the My Little Snugabunny Cradle n Swing comes with 2 different swinging motions plus 3 cradle positions to boot. It pretty much allows you to make it swing either back to forth, toe to toe, or even custom-adjust the cradle to whatever position will suit your kid the most. It is truly a versatile swing in every meaning of this word, for it doesn’t matter if you wish to gently rock your baby to sleep or maybe give them some entertainment when they are awake, this will be the best baby swing for the job. What I particularly like the Snugabunny for is how it features as many as sixteen different built-in songs plus two nature sounds to keep your kid entertained. Trust me, you won’t appreciate the variety in a baby swing’s built-in music player until you’re stuck with one that doesn’t have any variety! Because the last thing you need is having to listen to the same two baby tunes again and again until you go nuts. Another neat little thing is a built-in mobile and mirror, which can not only entertain but also help your baby develop eye coordination, as well as self awareness. The Fisher-Price My Little Snugabunny Cradle ‘n Swing comes with a built-in mobile that includes a reflective mirror among other things. There is also a bird “flying” around on the mobile, which also gives the baby some entertainment while also helping your child develop their eye movement and visual tracking skills. The said mirror is located right in the mobile’s center, which on top of entertaining your baby also helps them actually develop a sense of self-awareness! 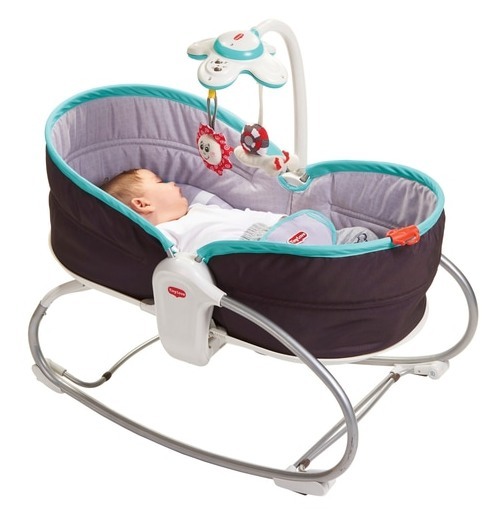 Is the My Little Snugabunny Cradle ‘n Swing Comfy For Your Baby? A very important aspect of every baby swing is of course its comfort. In this regard, Fisher-Price might have actually developed the best baby swing in the world here! For one thing, the above mentioned adjustable speed and cradle position enable you to adjust it in a way that suits your baby best. 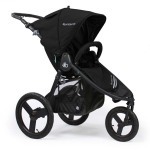 Every parent is bound to find a configuration their baby will love! Check how much Fisher-Price My Little Snugabear currently costs on Amazon, maybe you can find an attractive discount. What is more, it is made with awesome plush and the fabric on the seat is great. Fisher-Price made sure that it is fitted with fabric that will feel comfortable to babies on their delicate little skin. There are swings that are actually made of material that feels more like plastic, which is not very comfortable for babies, but this one is luckily different. In terms of comfiness, it is probably one of the the best baby swing choices we ever came across! Like all motorized baby swings, this one relies on electric power to run. You can either use four D-cell batteries which are not included, or plug it in with the included A.C. wall adapter. When in the swing mode, this swing can run for about three hours on four D-cell batteries which doesn’t make it a very convenient option. That’s why I suggest just using the included A.C. cable most of the time, which will save you a lot of money. Obviously, if you decide to bring the swing along when going on a trip or something, sometimes it may not be possible to plug it into a socket. In the event it does happen, the batteries actually will be a great choice. Thanks to its wide base and rubber grips, the Fisher-Price My Little Snugabunny Cradle ‘n Swing is pretty safe actually. One of the most crucial factors I suggest taking into account when shopping is having a wide base to make it stable. Fisher-Price surely kept that one in mind when designing Snugabunny, as it’s base is pretty wide and comes with a total of four rubber grips to make sure it stays in its place and doesn’t get knocked over by accident. Just remember to keep it on some level surface like all good parents do with baby swings and you will be set. The Snugabunny’s seat comes with sturdy, easy grips that make it safe and stable, whereas the swing’s steel frame provides the seat with good support. Last but not least, this swing comes with a five-point harness that looks kind of like those in baby car seats. It is there to keep the baby from falling out of the swing by accident, plus it fits the baby pretty comfortably, so they shouldn’t have any problems with it. If you’re looking for a baby gear for your kid, the all new Graco Sense2Soothe Swing, which can actually detect crying, might be the best choice for you. What particularly makes this one stand out is that it’s only swing on the market right now that’s actually operated by the baby. 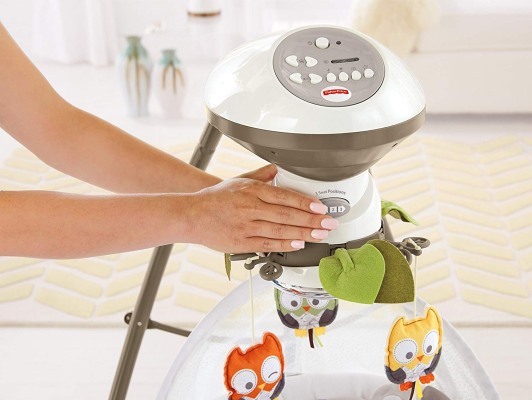 It pretty much adjusts all its setting options to the baby’s cries, complete with the motion and sounds. If that doesn’t make it one of the best baby swing in the whole universe, I don’t know what ever will! If you’re searching for anything made for babies, I’m sure the Graco brand is going to pop up in the search results. As it turns out, Graco is actually one of the most popular and renowned babyware companies that makes things like strollers, swings or car seats. They’ve actually been in the business for over 60 years now, which is actually kind of nice. Graco’s own Cry Detection Technology is probably what stands out the most here. The swing actually has a microphone built-in that is tuned specifically to detect the baby’s cries, to which it automatically reacts with adjustments to the settings of the swing in order to soothe them. It actually responds quite fast when the baby starts crying, at which point it readjusts the settings in order to comfort and soothe the baby I would be a lier if I said wasn’t impressed with this feature, and I might actually have a new favorite. Not only is the seat innovative in soothing the baby, but it can also work as a detachable and portable rocker, which allows it to be moved easily from one room to another. Which is especially helpful when you need to do some cooking or cleaning in different rooms. What probably makes the Sense2Soothe the best baby swing in a long time is how it can technically replace a rocker, a swing AND a bouncer seat for your kid. Being so versatile definitely makes it worth its price. Another helpful thing is how seamlessly it transitions from a swing on its motorized base to a portable rocker. It calms your baby using its 3 swing speeds as well as 2 vibration settings, which provides calming motions based on the ones caused by the baby’s mother. At first, the swing is all slow and gentle. Then it gradually picks up the speed, instead of going all at once and freaking your baby out. Another awesome thing is how the Sense2Soothe Swing can actually pick the ideal combo to calm the baby. It picks the swing and sound settings at random, but once the baby gets cranky, the settings change again in order to pick the best combo to soothe your child. I’m actually impressed with all the different movements it has. Besides all those different motions, it also comes with 15 songs & sounds, which is great at soothing your baby. There is music, nature sounds or white noise to choose from here. If you ask me, the music and sounds are actually pretty good. Newborns tend to enjoy white noise, which makes it a good choice here. The size of the seat is pretty good, and I really like how the seat here can move from front to back or from side to side. 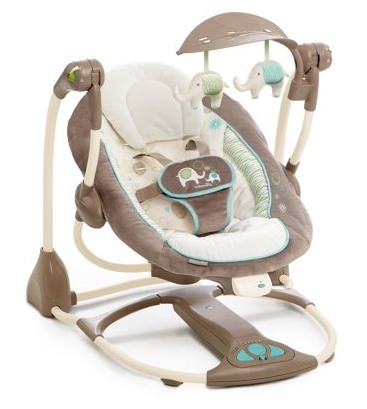 Another thing this swing has is 3 recline positions, which can be easily adjusted to the baby’s needs as well as give them soothing comfort, too. The Graco Sense2Soothe Swing comes with multiple automated options, but it also lets a parent be in control and manually adjust the preferences to their baby. Another nice thing is how you may save the baby’s favorite soothing settings as well. Upon turning off the “Cry Detection Technology” the Sense2Soothe turns into a more conventional swing, allowing you to adjust all sound and motion options by yourself. What every parent cares about the most is undoubtedly their baby’s safety. Besides the swing’s motions being designed with your child in mind here, Graco equipped it with a 5-point harness as well to keep the baby safely in place. Never forget about the harness. It is also nice how pleasantly deep this seat is, as it makes you sure that your baby will be protected from every side. 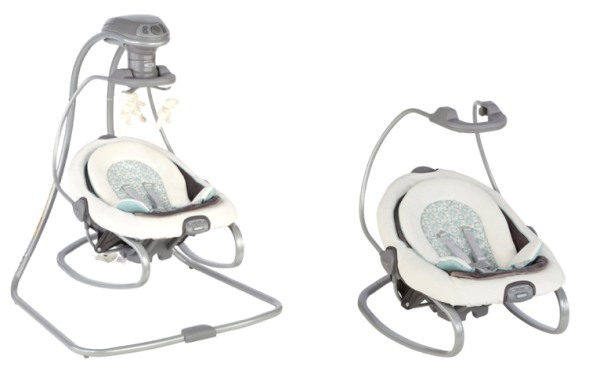 The Graco Sense2Soothe Swing comes in 2 different colors. Mine was in one that is called “Sailor”, apparently. It is in different shades of gray and can fit boys and girls alike. Sometimes it actually looks a little darker or even kind of brownish in my pictures. Their actual color is gray, though. The second color choice available is called “Birdie”, and it has cute shades of lavenders and plums. If you’re still unsure of the choice, check out other parents’ reviews on Amazon. It will help you with making a decision. The built-in mobile is simple yet very cute at the same time. It wasn’t difficult to put up and it can also be easily removed if you wish to carry this rocker around your home. There are 2 soft toys in the mobile hanging down to keep your baby stimulated entertained. The “Sailor” option came with a mobile where the soft toys were a light-gray moon and a light-gray bear with a teething ring. Just like the rest of this swing, the toys have gender-neutral colors that cn fit both boys and girls as well as nearly any baby room decor out there. This swing can calm my kid down the way I programmed it to, but it can also adjust to my baby’s cries automatically. On top of that, it can remember the last saved settings preferred by your baby. Can you find any other baby item out there that could do that? This incredibly unique feature in this swing is what makes it the best baby swing in my view. Majority of parents wish to have ways to care for their baby and love them while being able to look after the house and older kids at the same time. That’s just the swing for them. The swing can just adjust itself whenever your baby is cranky. When you remove it from its motorized base, it becomes a portable rocker actually. Thanks to those brilliant features, I can easily focus on other chores around the house. There’s no need to drop everything when the baby starts crying, as the swing will just do its thing and calm the baby down right away. Another key reason why I love this item is how you don’t need to buy other baby products when you have it. I personally like to keeps simple in our family. Which just makes me wanna shout: the best baby swing ever! This one single product can successfully replace a baby seat, a swing and a bouncy rocker as well. I’d say there’s probably few more things it could replace, actually. It surely can cut down on your shopping bill when looking for baby products. I can honestly say that I would recommend this swing to every parent out there. It is especially useful with those babies who just want to be held all the time. There is no way any parent could not like this brilliant and versatile swing. You care a lot about your child’s comfort and good sleep. But what if it was possible to combine the two to make the perfect swing & sleeper? Because that’s exactly what good old Graco did when creating their Graco Dreamglider sleeper & swing. 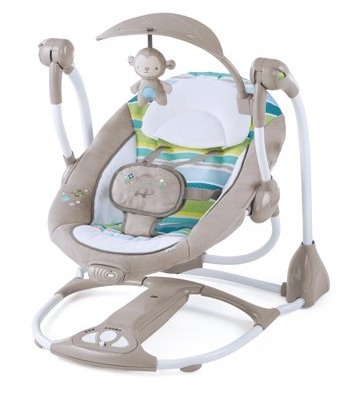 It is the best baby swing & sleeper while costing much less than a lot of other duos available these days. What can be better than having a baby swing and a place where your baby can sleep? Having just one thing that serves both purposes. Forget about having to buy two different things just to keep the baby happy. Now you just buy one thing and you can know that your kid will be comfy and relaxed when chilling in this awesome design & safe sleeper. What I love the most in this double option is that you can keep the baby in it while changing the position. Which means if the baby falls asleep while in the swing position, just pull the lever and it turns into a sleeper without waking your child. Who wouldn’t love that? That’s what majority of parents worry about the most in baby products. Will this swing be safe for my child? Could they fall out of the swing in theory? Will this swing be able to hold their weight? All those questions are very valid, considering we’re talking about baby products. You will be happy to hear that the Graco Dreamglider actually has a built-in three-point harness that will keep your baby safe and secure in it. And of course, you should have an eye on your kid while they’re in the swing sleeper, as you may never know when something bad might happen when you turn around. What baby doesn’t love toys that move? That’s another nice extra thing about this particular swing. There’s a built-in overhead toy mobile. It can keep your child entertained for some time. Babies love visual stimulation, and their little eyes can catch the slightest things. It may even be possible to replace the toys in it with some existing ones. 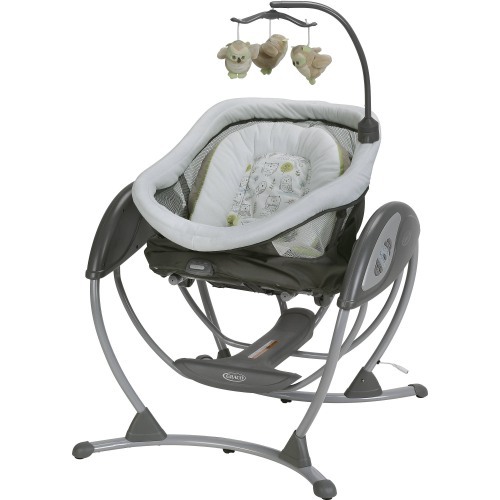 One brilliant feature in this Graco Dreamglider is the ability to mimic your regular glider’s motion. Which allows your child to experience those relaxing gliding motions by themselves. On top of that, it actually vibrates when gliding, too. It comes with two different vibrating speeds for you to choose from. In my view it’s an amazing feature, as I can easily attest that babies just love the motion of nursery gliders. Being able to replicate it in a swing sleeper is a great option. There are no two people who always like the exact same thing. The same goes for babies. Which is why this swing comes with different options for the speed, music and sounds to choose from. 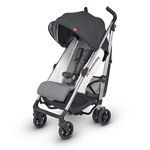 With six different speeds to select from you’re bound to find the one that fits your baby best. Whether they like excitement or would rather keep things slow, there will be a perfect speed for them. 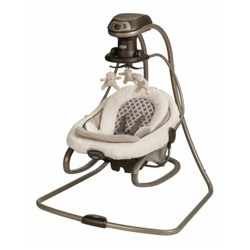 Wondering whether to choose Graco Sense2Soothe Swing? Check out the opinions of other users of this baby swing at Amazon and see if there are any discounts available. Babies just love the sounds of nature. You get a total of five sounds to choose from that will make your child giggle with excitement. That’s the magic of music! There is a lot of melodies, ten to be exact, for your baby to jam to. Always follow the recommendations on how long your baby should stay in a swing or a bouncer at a time. That being said, it isn’t exactly difficult with the Graco Dreamglider as it also comes with a timer you can set for a selected period of time. I would never let my child swing for longer than fifteen to thirty minutes at a time, and plenty of parents agree with me on that. Thanks to the timer you can also save the battery, which is always a good thing, too. The Dreamglider’s biggest pro and con is that you can use batteries to power it. Which is awesome if you wish to cut down on your power bill. That being said, though, batteries mean an extra expense. The choice is yours about which option you prefer. The upside here is that in case you have to take the sleeper along when going somewhere, the batteries will allow you to enjoy all of its neat little features wherever you are. Another nice upside to battery power is that there’s no cord lying around, which eliminates the risk of tripping over, especially once the baby learns to walk. 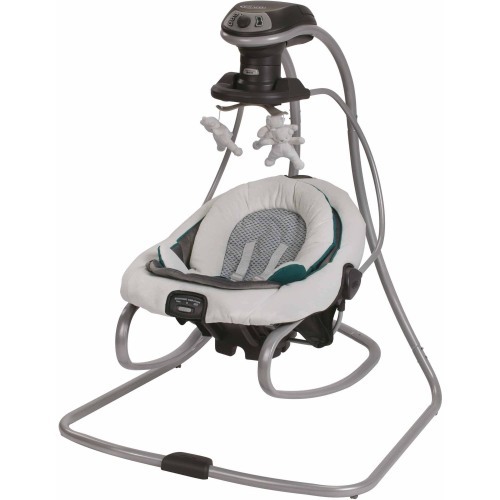 The Graco Dreamglider can suit babies of many different weights from 5.5 lbs to 30 lbs. This swing sleeper can last your baby for quite a few months. The smaller your baby is, the longer they will get to enjoy it. Remember, though, that when they get bigger and more mobile, babies may not like being stuck in a swing anymore. Which can actually pose a safety concern when the baby can sit up completely or even try to get out of their swing. Which means that although technically the weight limit is up to 30 lbs, it’s better to watch out too, as all babies are different and mature at different rates. Should I recommend the Graco Dreamglider, then? Sure! 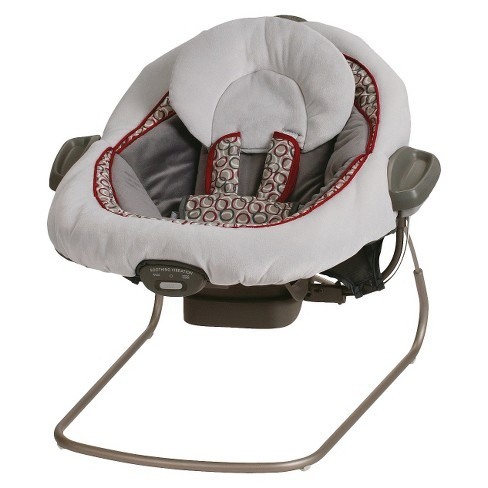 This is a great, durable choice for your baby that can serve different generations of babies. That’s pretty much it when it comes to the Graco Dreamglider Sleeper. I am pretty sure that you are now informed enough to make a conscious decision. For something this small, the Graco Simple Sway Baby Swing comes with plenty of features that can help you comfort, soothe and relax your baby. It means this swing can give you a lot in a small package, which is one of the best baby swing combinations. This particular swing can both run on batteries and be plugged right into a wall socket. Both options have their upsides and it is up to you which one you prefer. It comes with a total of six swing speeds to better accommodate your child’s mood, as well as a relaxing side to side swaying motion. They say that children are one of the life’s greatest blessings. While some people don’t get to experience it, others get a lot of it. And if you’re actually reading this, chances are you belong to the latter group. So you’re now getting ready to take good care of that little bundle of joy. Among the greatest things you could do for your little one is protecting them and showering them with care. Which also means you will always have to be at their service. Sometimes you can get pretty exhausted from all of it, though, especially if you also have a job at the time. To take some burden off your shoulders, you just need to get some baby products to do some of the work for you. One of such products is definitely a baby swing. 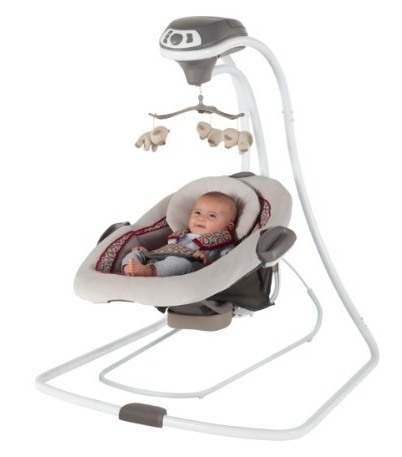 In the following article, we will take a closer look at arguably one of the best baby swing products available now: the Graco Simple Sway baby swing. If you don’t live in a spacious house, you might worry where you’re going to put this thing. The Graco Simple Sway swing, however, was pretty efficiently designed, which means it won’t take much area. Thanks to that, you can easily find a place for it where it won’t be getting in the way. In terms of carrying it around the house it is pretty convenient as well. In terms of assembly, it’s probably the best baby swing as well, as it’s not only easy to put together but once it’s fully assembled, it’s pretty sturdy as well. Taking the baby in and out of it is pretty easy, and it’s also very easy to transition from the swing when your child is asleep. Another nice thing about this particular swing is its neutral print that allows it to go with nearly any surrounding. But the best thing, though, is that it can still be used after your child finally grows out of it, as the recommended weight limit here is for babies from 5.5 lbs all the way up to 30 lbs. Overall, for most babies it’s a perfect weight range. If your child grows out of this swing before starting to use it, it won’t be fit for them. That’s why, before you buy it, you should make sure that your child’s within the permitted weight range. The swing is pretty quiet, so you don’t need to be worried that you’ll hear your baby wail few minutes after you quietly put them in their swing. As everyone knows, if the swing’s motor is quiet, not only will the baby sleep in peace during their nap, but they’ll also love their swinging time because there won’t be any white noises. The swing comes with 6 swing speeds, although majority of parents probably won’t even get beyond the fourth setting. You certainly won’t have any problems finding the right speed for your baby’s mood at the time. Higher speeds are better when the baby is light, and when they’ve just eaten the lower ones will be enough. Higher speeds are good when they’re awake and lower when they nap. If your baby doesn’t weight at least 7 lbs, however, it is better to stick to the lower speeds. Higher speeds are better left for when the child is at least around 10 lbs. With its smooth side to side movements, the Graco Simple Sway could probably be the best baby swing to soothe and relax your baby. It’s especially convenient when your hands get fatigued fast and you still need to soothe your child somehow. It is also useful when you need to work on something important but still want to have the baby nearby without getting distracted. 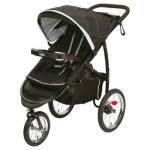 Are you thinking about buying Graco DreamGlider? Check how much it currently costs on Amazon, maybe you can find an attractive discount. Another thing that makes the Graco Simple Sway arguably the best baby swing is how you don’t need to rearrange your whole living room to be able to assemble it and put it to use. While Graco Simple Sway is absolutely a full size swing, it actually doesn’t need that much space, which is another great thing about it. As can be seen here, the seat makes a great compromise between a full-size swing and not taking much space, just as you’d expect from the best baby swing. Who wouldn’t love to be able to spend some time outside, reading a book or basking in he gentle breeze, all while having their baby right there with them? While some other swings can only rely on batteries for power, this one can actually give your child all it has to offer by getting plugged into a wall socket as well. In most cases, batteries are actually not enough for your baby to truly enjoy their baby swing to the fullest. Some people may argue, however, that batteries can help you cut down on the power bill. It doesn’t really matter that much considering that you still need to spend some money on new batteries and if you don’t have any spare ones when they die, you might just be stuck with a cranky baby and no power. If it just happens that you need to calm down your child at 2 AM and are all out of batteries, you know how frustrating it can be. But not with the Graco Simple Sway, where you plug it into a socket and you’re back in the business. Soothing a baby is possibly the most crucial function of any baby swing. Without it, a swing is pretty much useless, even if it’s the best baby swing in the whole universe. 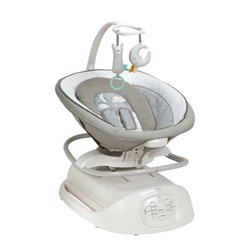 The Graco Simple Sway swing has 2 speed settings for vibrations to help you calm your baby down. It is also possible to pick the pace that best suits your child’s mood at the time. You can turn it on or off when needed. It also comes with 10 melodies and 5 nature sounds that will easily keep your baby entertained. One of the best features in this swing is its generous, broad seat that will surely come in handy when you happen to have a bigger child. In order to feel comfortable, babies tend to need a lot of space, and when a baby is bigger, it becomes even more crucial. 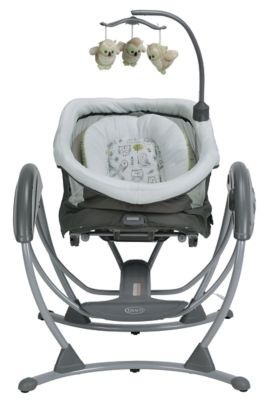 Interested in purchasing Graco DreamGlider? Check how much it currently costs on Amazon, maybe you can find an attractive discount. Thanks to the spacious seat, your child will be as comfy and relaxed as a baby can bee, especially when swinging or napping in it. It also comes with a detachable head support that can be machine-washed, providing your baby’s head with all the support they might possibly need. While baby swings are great at keeping your baby in place and letting you focus on something else, it doesn’t mean you can just forget about your child or put them in danger. In order to prevent such possibilities, this particular model is equipped with a security system meant to hold your child in place even when swinging about. One crucial feature of very swing is the harness system. Without it, there is no way to keep your baby securely in place, especially if they are of very young age. To make sure nothing bad ever happens, this brilliant swing comes with its own built in 5-point harness. In case you didn’t know it yet, it’s a set of fabrics and straps that keep your child snugly in place to prevent them from accidentally slipping out when napping or swinging in it. The Ingenuity ConvertMe Swing-2-Seat could probably be a candidate for the best baby swing title. On top of being a swing, it can also lock into a seat, plus it can both swing AND vibrate. On the other hand, some people also complain about its manual or difficult assembly, as well as the head support, and apparently someone also complained about problems with moving it. Swing & seat: The Ingenuity ConvertMe Swing-2-Seat can keep your child both in the upright and reclining position, which can be adjusted using screws on the sides of this swing. The upright position is the best for things like playing with toys, whereas reclining is great for sleeping or swinging. Although swinging is only possible when the swing is down and unlocked, it can vibrate in any position. 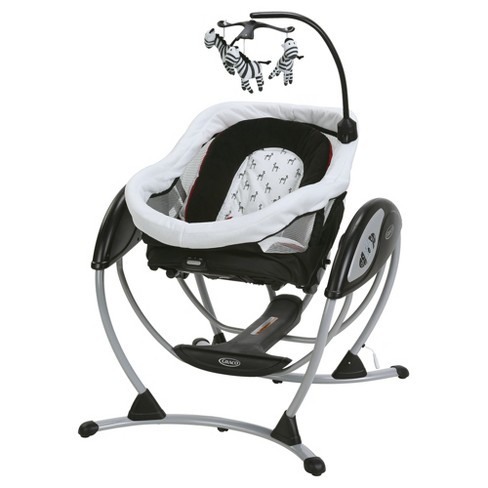 Swinging: This convertible swing comes with five speed settings to choose from. It can swing back to front and also vibrate while swinging. Thanks to all the different settings you can adjust the swinging power to your child’s preferences. If the baby feels cranky and needs some distraction, just set the swing to the highest setting. If they’re asleep, on the other hand, set it to the lowest setting to rock them gently. 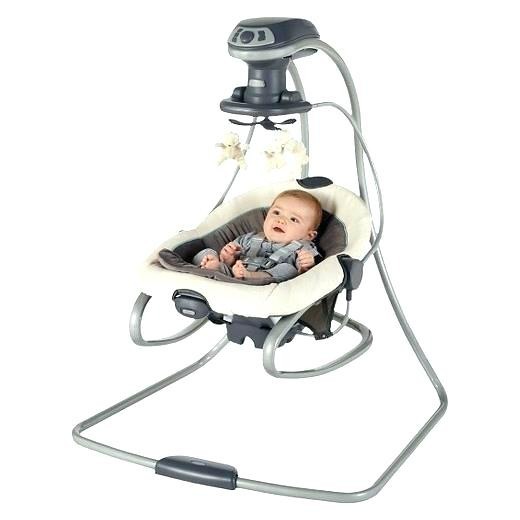 Vibrations: This particular baby swing can vibrate while swinging or when locked in the upright or reclining position. Thanks to its ability to vibrate, it can also double as a swing and bouncy seat so you don’t need to spend money twice. Since I’m soon going to be a mother as well, it is important to me to be able to spend money wisely and make the best use of everything. Compact size: Thanks to its weight only being 9 lbs, the Ingenuity ConvertMe Swing-2-Seat is very compact. You can easily move it around the house and it won’t take much space. Thanks to swinging back and forth, it has no problem fitting into smaller areas, like by your bed or chair for easier access to the baby. If you have a smaller apartment, it might well be the best baby swing for you. You may also fold it down to store away or carry along. I just can’t get enough of this swing’s light weigh. Right now I’m in the middle of arranging the baby room and, being seven months pregnant, I shouldn’t lift heavy stuff. But thanks to this swing being so lightweight, I have no problem moving it around, and I bet I will be able to after my C-section as well. Long Lasting Battery: In terms of power efficiency, it’s probably the best baby swing right now, as it uses the Hybridrive Technology that helps it use less battery power while also making less noise. With a clever use of magnets and gravity, this technology can keep your baby swinging for a long time. There is also a sensor, however, that has to always be aligned or else the swing won’t do its job. This swing also needs a little push to get started, which actually makes the battery last even longer. If you ask me, I’d much rather have to shove it a little in the beginning rather than having to replace batteries every few days. Melodies & nature sounds: This baby swing also plays eight different calming melodies as well as three nature sounds. So when you just can’t seem to be able to console your baby, just put them in the swing, set the highest swing setting with the vibrations on, and put on a loud, calming melody – it should get them to calm down in a breeze. If you still hesitate whether to choose this baby swing, check the reviews of other parents who bought it on Amazon. Machine-Washable Seat Cover: Babies can be pretty messy at times, so their seat has to be easily washable. Luckily this swing’s cover can always be washed in a washing machine. Some things, though, like the elephant on the buckle, will still need a good scrubbing. Swing’s Timer: The Ingenuity ConvertMe Swing-2-Seat comes with a timer that has three settings to select from. At thirty, forty-five or sixty minutes, you can choose how long you want your child to swing in it before it turns off to conserve the battery power. It will especially come in handy when you have something to do around the house while the baby is having a nap. 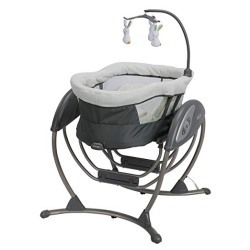 Comfy: Finally, this particular baby swing is extremely soft and comfy. It has contours to fit the baby’s body and to support them in there or keep them in the upright position when playing with the toys overhead. 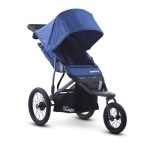 It has shoulder straps that are great at keeping more lively children in place. It literally takes no more space than a pillow, which makes a difference in smaller living spaces. It’s pretty lightweight and easily folds up when has to be stored away or taken along. As a parent, you just always need to do things around your child, like soothing them, entertaining them and lots of other things throughout the day. Luckily, it is possible to get a little help for just few dollars. I’m talking here about possibly the best baby swing from Graco these days, which is the Graco DuetConnect LX swing & bouncer. What’s the target market for this product? Every parent in desperate search for the best method of soothing and entertaining their baby will certainly find it the best baby swing they’ve ever had. It gives you a great chance to navigate around your home while keeping a watchful eye on the baby and keeping them soothed and entertained all along the way thanks to this product’s incredible features. This product actually serves more than just one purpose. 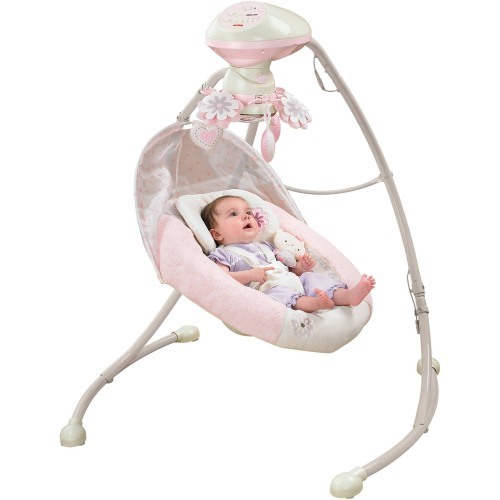 It is a swing and also a bouncer at the same time, thus providing you with 2 ways to soothe the baby. 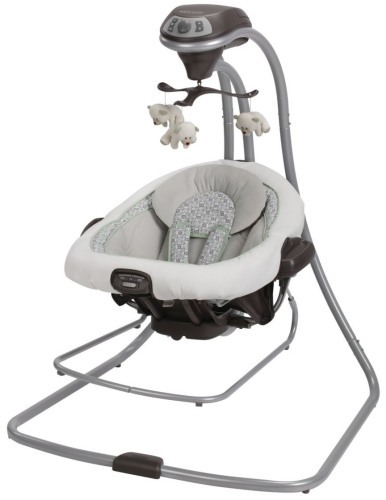 The Graco swing & bouncer comes with a swing chair with a seat that allows you to move around your home while carrying it, which keeps the baby comfy and entertained. 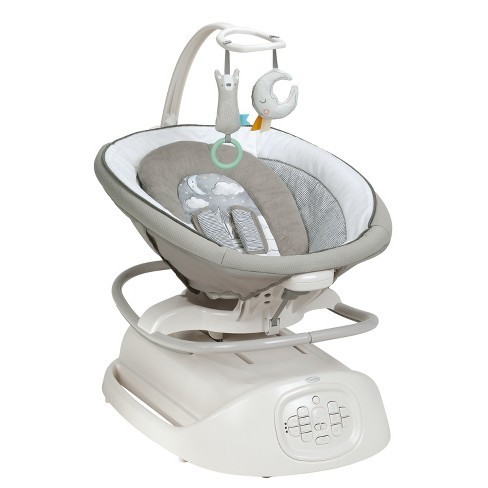 The Graco swing & bouncer has a built-in gentle vibrating feature that soothes and relaxes your baby. There are 2 settings for the vibrations so that you can choose the tempo according to the mood of your baby. 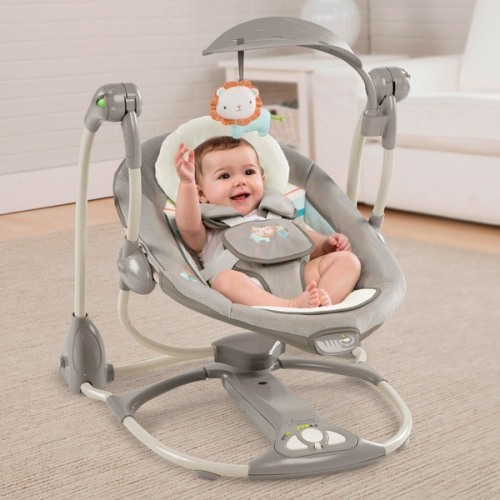 With the vibrations on, your baby will feel like on a calming ride. 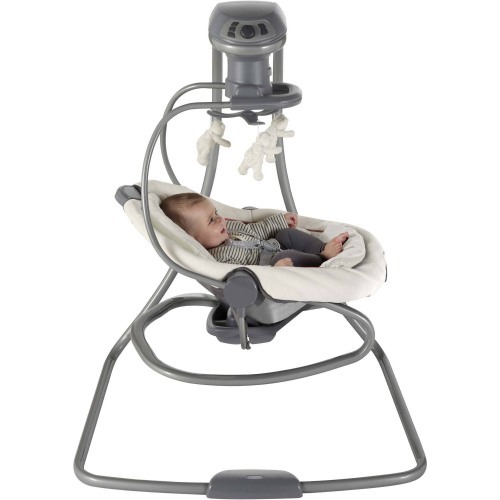 The Graco swing & bouncer also comes with a spacious seat that is fitted with nice soft fabric as well as decent head support that can keep the baby comfy all the time. You can adjust the seat in various reclining positions that allow you to set it upright when teaching your kid how to sit up. It can also suit newborns when you fold it down. Your baby certainly won’t get bored in this bouncer; it features ten lovely melodies plus five sounds of nature that will help them with discovering new things. There is also a variety of toys hanging overhead, which can help your baby improve their eye-hand coordination too. Before you decide to buy Graco DuetConnect, check if there are any discounts available and how other parents rated this baby swing. 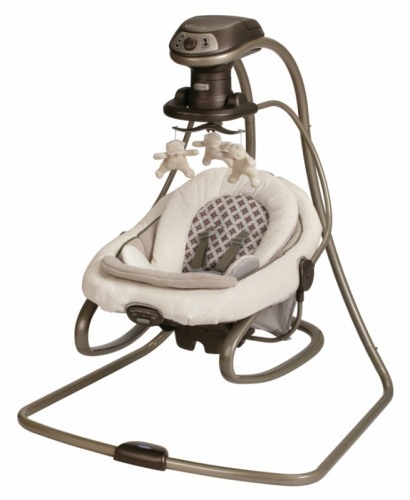 The Graco swing & bouncer can provide you with the best baby swing safety a parent could want. It comes with a five-point harness that prevents your kid from accidentally slipping out while swinging. The straps on the harness also have covers that can protect the baby’s skin from its rough edges. 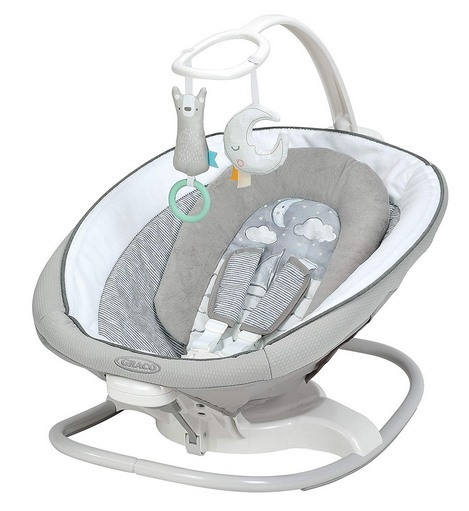 The Graco swing & bouncer comes with 6 swing speed settings that will make it much easier for your baby to relax while in it. It allows you to set the exact speed and pace you want for your child, and then pick the right music as well to go with the combination. 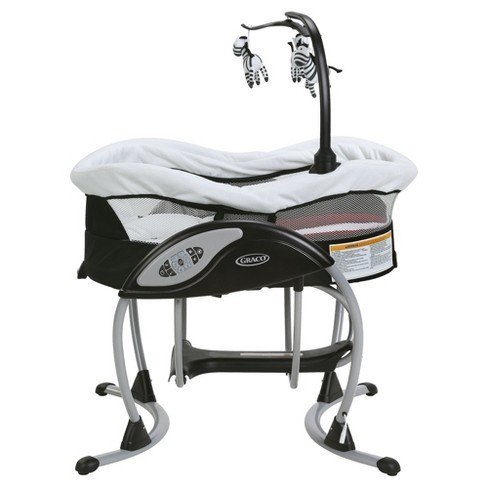 The Graco swing & bouncer allows you to choose what it will run on. You can plug it into a wall socket, and when there isn’t any, just put in 4 D-cell batteries for swinging and then one more D-cell battery for vibrations, to keep your kid entertained wherever you are. Although it couldn’t possibly get any easier to assemble, there is also a manual included for those that might actually need it. 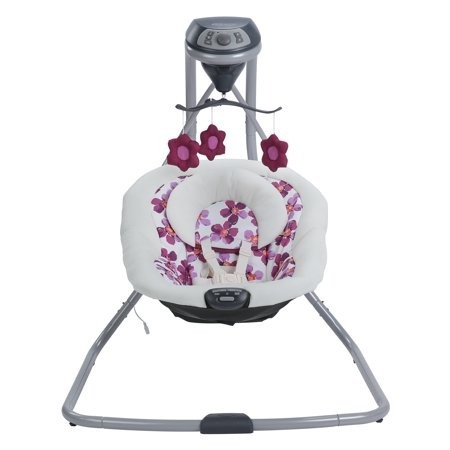 The Graco swing & bouncer is very safe for your baby with its five-point harness as well as comfy, reclining seats. The product is only 29 inches long, 34 inches wide and 43 inches high. It is made of strong metal, but it only weighs 25 lbs, which is pretty light in this case. It doesn’t prevent it from having capacity of up to 30 lbs, though.